Thank you very much for mentioning our interview. 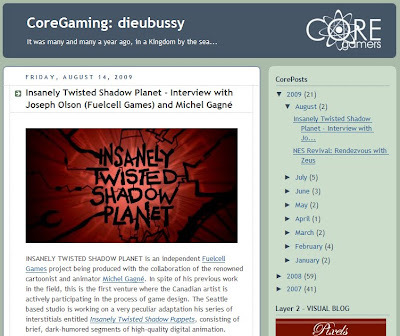 I can't wait to play Insanely Twisted Shadow Planet (the game title is lovely, by the way). looking forward to see it on the shelves :) of our insanely twisted shadow planet. I'm glad this won't be exclusive; that would be tragic. This is yet another reason to own a PS3, it sounds like. However, I will again respectfully request that you at least consider not signing onto any deals that exclude the option of Linux and other versions in the future. I won't go into any sappy dramatic hyperbole about openness and freedom; I just like portable code and good games. Oh, and I happen to know of a few people with some amount of experience porting awesomeness to this OS. :) Thanks for listening.